We are very happy to announce that Peerless Hospital in Nigeria has chosen Medical for their institution. I have been contacted by Mr. Agu Chibueze who told me their decision of using Medical to implement their Hospital Information System, as part of the African Health Network. This non-profit effort is part of the GNU Solidario project, who delivers education and hea lth to emerging economies with free software. This is a very challenging project in which we will put all our effort to deliver a system that will optimize their healthcare. We already set up a development server and are working on a daily basis with the Nigerian team. Many thanks to Agu, Dr. Emmanuel, Chibuike and the Peerless Hospital for their great mission on helping out the people of Nigeria, and for trusting Medical and GNU Solidario. The African Health Network is a new organization with the primary aim of centralizing Electronic Medical Records within Sub-Saharan Africa. The African Health Network plans to achieve this using strictly open source tools. AHN has chosen OpenERP from Tiny and Axelor as their framework of choice and the medical module from Thymbra. Currently, online healthcare is far beyond the reach of the common African. While the project is expected to be self-financing, AHN has chosen open standards to bring affordable online healthcare to even the poorest of people within the region. The African Health Network hopes to start its operations by the middle of this month. There are three people central to this project, a doctor and two computer professionals. 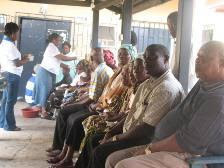 AHN will be starting out with Peerless Hospital and Wellness in Warri, Delta State, Nigeria as the first member hospital and the Global Medical Missions as the first member health organization. The AHN project is the first of its kind within the region and is bound to face challenges ranging from poor internet connectivity within the region to a low level of computer literacy amongst health professionals. AHN, however has been working out collaborative relationships between Internet service providers and is planning for an effective computer training program for future members of the online network. think that becasue of Medical, the doctors will be able to give better diagnosis to the patients resulting in better health therefore they will provide better support for their families..
Existen dos tipos de miserables: las personas que sufren la miseria y aquellas que la generan. La concentración del poder en el actual modelo socio-económico es tan injusta como insostenible. La privatización de la Salud Pública pervierte el derecho a una vida digna. La brecha social se profundiza, con ricos más ricos y pobres más pobres. La codicia y el cortoplacismo del sistema están destruyendo la sociedad y el planeta. La contaminación medioambiental, la galopante deforestación y las granjas industriales son responsables del cambio climático que amenaza a las próximas generaciones. Millones de animales son privados de su libertad y condenados al holocausto. Bebés arrancados del lecho materno destinados al matadero o encarcelados de por vida en mega granjas industriales en condiciones deplorables. Especismo y antropocentrismo inútil y despiadado, responsable de enfermedades cardiovasculares, cáncer, resistencia antibiótica y cambio climático. I got great news ... I won a Shuttleworth Foundation grant ! During the flight from Madrid to Las Palmas, I thought on where would be the best project to put the grant resources. After some thought, I came to the decision of using them on the research and integration of Free Hardware in GNU Health . Initially, I will work on integrating Arduino with e-Health sensors into GNU Health. The functionality should allow recording real-time clinical information, such as Oxygen saturation (pulse oximetry) and heart frequency. I will also work on the ECG sensor.